Cobia are a long, slim saltwater fish with a lower jaw that extends past the upper jaw and broad heads. They have small scales and smooth skins and tend to be dark brown in color. Their belly is usually white and they have two horizontal dark brown bands on their sides. They have large pectoral fins and are sometimes mistaken for shark. 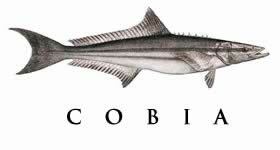 Cobia are also known as black kingfish, black salmon, lemonfish and ling. They can be found in inshore and nearshore waters, often grouping near buoys, pilings and wrecks. They prefer warmer waters of the West and East Atlantic Ocean and the Caribbean, India, Japan and Australia. Although generally a solitary fish, they will congregate near wrecks and pilings. They tend to winter in the Gulf of Mexico and migrate north to Maryland in the summer months. The larger fish have a tendency to have a couple of long runs, careful to not pull an energized Cobia into the boat as they can cause quite a scene and damage to the unsuspecting. Crabs and squid are good bait for Cobia, as is generally any small live bait. Keep the bait closer to the surface. Use medium to heavy tackle – as they can easily weigh more than 30 pounds. It is not uncommon to catch a 50-80 pounder! Having a unique taste as compared to most fish, the Cobia does well being baked or smoked.